You’ve probably taken baths before. You fill your tub with warm water, climb in, grab your soap or bath gel and wash yourself, and that’s it. Simple, right? Well, not really - not if you want to get the most out of your bathing experience. Your bath shouldn’t just make you feel clean; your skin should glow, feel smooth to the touch, your body should feel refreshed and rejuvenated. All the stress of the day should melt away by the time you step out of the tub, and you should have a glorious, uninterrupted sleep. The perfect bath requires some know-how and we’ve got some secrets to ensure your next bath will deliver unbelievable benefits to your body and your soul. Bathing Secret #1: Transform your home into a spa! Imagine going to the spa once a week to take care of your skin, to cleanse and to nurture your body. For most of us, this is a distant dream - there’s no way you could afford a weekly spa visit. But you can afford to take a bath once a week, and bathing can deliver the same benefits as a trip to your favorite retreat - without breaking the bank. So book your next “spa day” with no one other than yourself, and go as often as you like. Buy some high-quality bath salts of your choice, make your very own mud mask, and soak to your heart’s content.You will see immediate results. Bath Secret #2: Got a cold? The perfect bath will help! Taking a bath is a powerful way to treat cold symptoms. If you have a runny nose, a bad cough or tired, aching muscles, taking a bath can make you feel better in no time. Sprinkle some bath salts infused with Peppermint essential oil for your sinuses and cough; mix in some Dead Sea salts, known to soothe aching muscles. Bathing Secret #3: If you use the right ingredients, bathing makes you look younger. It’s true - high-quality, natural bath salts can take years off your appearance by helping your body defend against climate and UV exposure, genetics, and other elements that speed up the aging process. Not only that, but natural salts can help your skin repair and restore it’s youthful smoothness and vitality on a cellular level, addressing existing signs of aging such as fine lines and an uneven skin tone. For the best results, add some of our Minera Dead Sea salts in your bath - plain or infused with your choice of essential oils and herbs. Bathing Secret #3: Atmosphere is key. Before you take your bath, make sure the lighting in your room is soft and low. Either dim the lights or place candles along the rim of your tub. Bring in a portable CD player and play your favorite, soothing music. Before you know it, your bathroom will be transformed into a quiet, tranquil oasis. 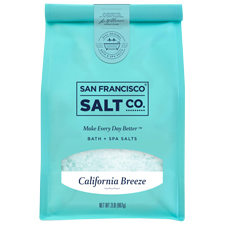 Bath Secret #4: When it comes to bath salts, the more, the better! Don’t be shy! Be generous with the bath salts - the more, the better. Grab a handful or, even better, two - and hold them under the running water as you draw your bath, allowing the salts to release their fragrance and oils into the steam as they fall into the water. The idea here is to replicate an oceanic environment - after all, there’s nothing more therapeutic than soaking in the sea! Bath Secret #5: Keep that curtain closed. After you step into your bath, either partially or completely close the shower curtain or door. This not only seals in heat (so water takes longer to cool), but it keeps in all that fabulous, fragrant steam. The steam will open and cleanse the pores in your skin, giving you a youthful, healthy glow. Bath Secret #7: Start the day with a bath! When most of us think of taking a bath, we think of taking it at the end of the day. To be sure, bathing in the evening has many benefits - washing away the stresses of the day, preparing for a good night’s sleep, etc. But taking a bath in the morning is a wonderful way to begin your day. Use some rejuvenating bath salts infused with a peppy citrus scent and you’ll feel energized, refreshed, and ready for the day ahead. Bath Secret #8: Not so fast - keep soaking! After 10 minutes of soaking, you may be tempted to hop out of your tub and go back to other activities. Instead, lie back and stay there for another 10 minutes. 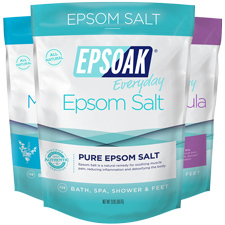 The bath salts will have time to work their magic on your skin while the warmth of the water improves your circulation and lowers your blood pressure. Not only will soaking longer help your body, but it will greatly benefit your mind. Believe it or not, it takes a while to get “used” to relaxing - those first few minutes are often spent thinking about appointments, projects, and deadlines. Once your mind is clear, close your eyes and relax!